Tater tots are deep fried, grated potatoes served for starter or as a side. Usually prepared with potatoes, you can dish out this fantastic, dangerously addictive small bites with different vegetables. These tater tots are known very much for their cylindrical shape and crispy exterior. However tater tots can be baked as well if you want to make these deep fried beauties as a guilt free snacks. 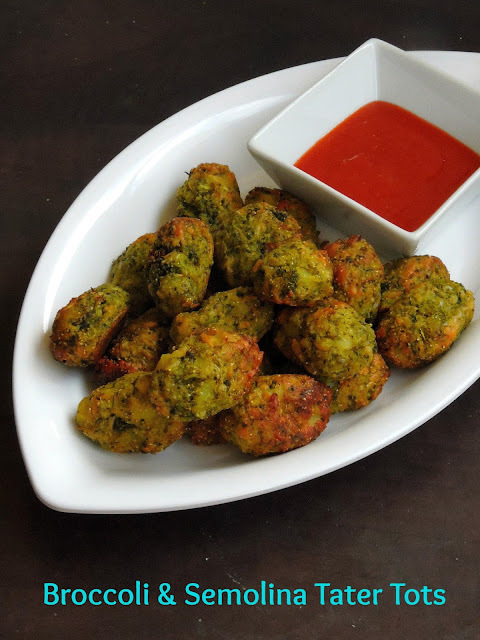 My today's recipe goes for Broccoli and semolina, yes you heard it rite, my own version of tater tots have semolina in it. I was supposed to cook and blog with two different ingredients which a fellow blogger suggested me to post under Fusion theme for this month's Shhh Cooking Secretly event started by me, which is now hosted by Mayuri Patel. After a lipsmacking tangy Chettinad gravy, am taking you all to God's own country, my today's post is a Kerala style curry. You might have heard a lot about Erissery but what is Elissery, its also a curry dish served during onam sadya. 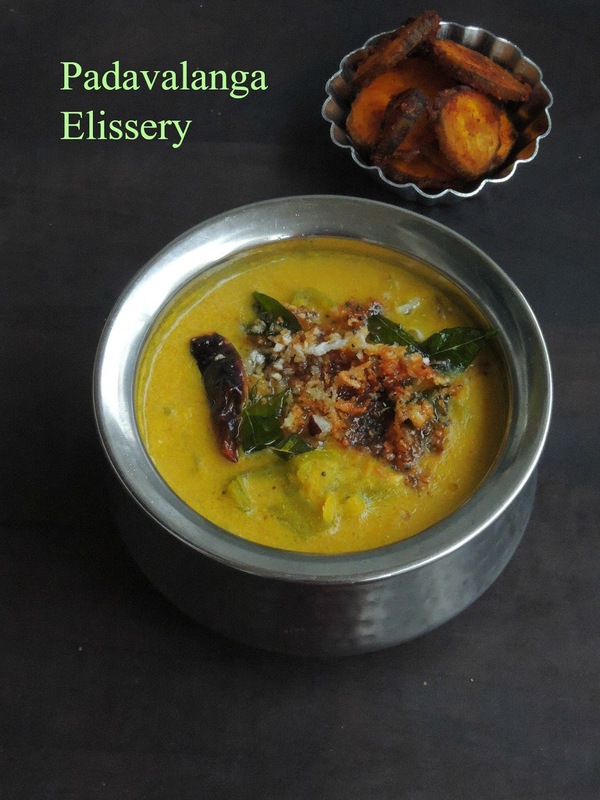 While whatapping a friend, i heard that she cooked Elissery, i was totally confused when i heard the name of this dish, then later she explained me that this Elissery is one of her mom's signature dish which is cooked in most of the areas around Kannur.Obviously she explained me how to dish out this kootu curry. Without any fail, i prepared this Elissery for our lunch. Though this curry is prepared usually with channa dal, you can also prepare this curry with toor dal. 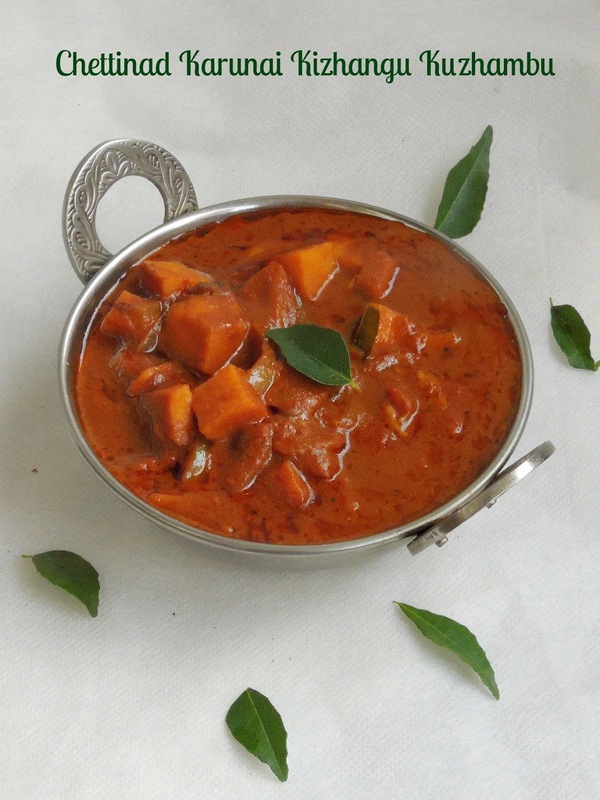 Chettinad cuisine is one of the well known and more popular cuisine of Tamilnadu. This cuisine is famous for its flavorsome cooking style. 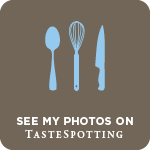 This cuisine is very much close to my heart. Though am a Pondicherrian, i have been pampered with delicious dishes from Chettinad cuisine as Pondicherrian cuisine is a lovely medley of various cuisines. Obviously this chettinad cuisine is one of my most favourite cuisine.There are so many variation of Kuzhambus aka tangy gravies in South Indian cuisines, however the cooking style and ingredients may varies depending upon the tastebuds. Karunai kizhangu aka Elephant yam is a tuber, which can be prepared as many different gravies, curries or else simply as fries. Coming to this chettinad style kuzhambu,this gravy tastes almost like Karakuzhambu or puli kuzhambu though this gravy is mild in taste. Theeyal, this is a lipsmacking Kerala dish prepared very much with nicely roasted coconut pieces, coriander seeds, dry red chillies and fenugreek seeds. Once roasted all these pieces are grounded to a paste and cooked in tamarind water with vegetables. This dish looks very rich brown gravy in colour to be served along with rice. Theeyal means Burnt dish, since coconut pieces are nicely roasted until they turns dark brown in colour, this gravy is named as though. This dish have its own place in traditional Sadya menu. Though theeyal prepared with Pearl onions is quite popular, many vegetables can be cooked as theeyal. 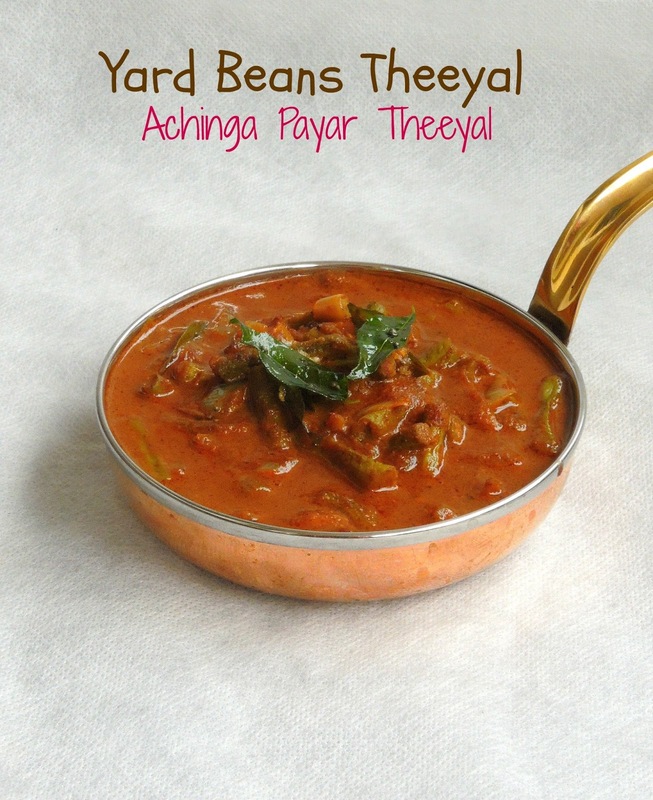 I learned this Achinga payar theeyal from one of my friend's mom long back, which was in my hand written note book since a long, finally i prepared this theeyal few days back at home. Crazy about caramel, i picked this theme for this week's blogging marathon, and i enjoyed thoroughly baking some ultimate bakes with caramel sauce. My today's post is the final post for this week's theme and this cookie dough bar is the recent most favourite baked treats of my kids. Actually i planned everything to bake a upside down cake with caramel sauce, since i ran out of eggs, i searched for a different recipe to bake with simple ingredients. 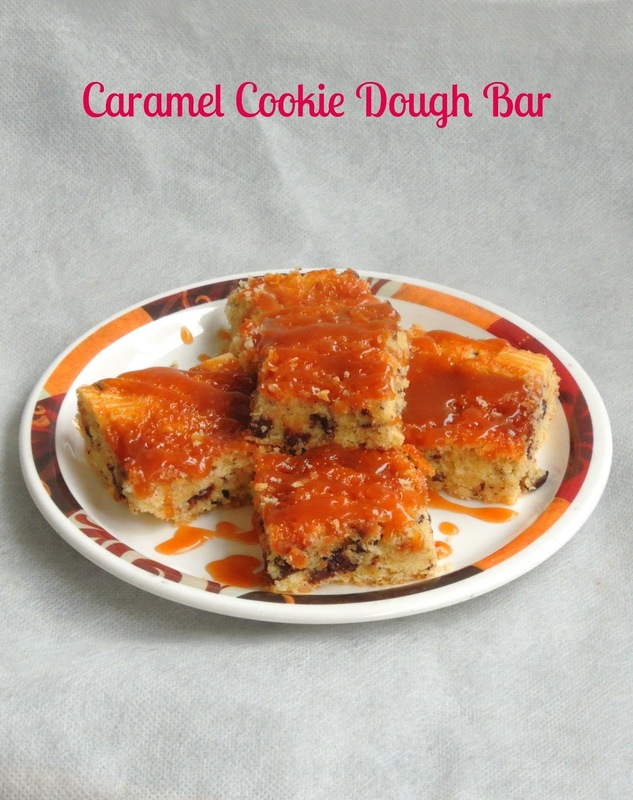 After googling, i came to know that with less and usual ingredients, i can bake some alluring caramel overloaded cookie dough bar. Immediately i tried my hands with it and they came out extremely buttery, utterly delicious with a crunchy outside and soft inside. Simple dessert, definitely an easy breezy one to give a try is this ultimate parfait. This parfait calls for mascarpone cheese, caramel syrup, some crumbled chocolate cake and few chocolate fudge bites. Double bonanza for chocolate and caramel lovers definitely. If you have some leftover chocolate cake and some chocolate fudge, this parfait will gets ready very much quickly than you can imagine. A prefect crowd pleaser, fantastic party menu dessert to prepare and serve with your loved ones. This parfait will definitely please your sweet tooth and am sure you will definitely fell in love with this fantastic parfait. Caramel, this word itself makes me drool, after chocolate i have a soft corner to caramels. My handbag will always have caramel toffees. I dunno why but i cant go out of the home without my toffees. You cant resist to these ultimate sauce. Obviously this week's post are going to be Caramel loaded bakes and desserts. Salted Caramel sauce can be prepared very much easily with just sugar, butter,salt and cream. To make this caramel sauce, you just need some patience and am sure you will succeed to get prefect sauce with less efforts. 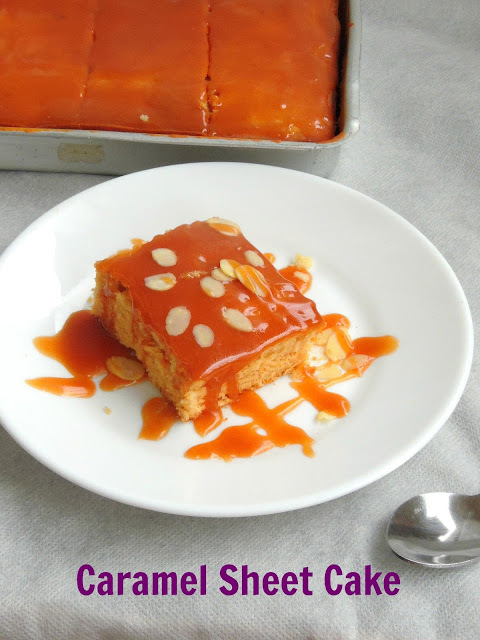 I picked Crazy about caramel as theme for this week's blogging marathon, and for the first day, here comes an ultimate caramel sheet cake topped with salted caramel sauce. Peanut butter, this vegan butter is a must in my pantry, we are huge fans of peanut butter, obviously i dont forget to grab it. Peanut butter makes excellent baked treats, obviously i love to bake with this butter. When i picked Valentine's day Special recipes as theme for this week's blogging marathon, i cant think more than baking a simple heart shaped biscuits with peanut butter. This easy breezy butter cookies like biscuits takes very less time to prepare the biscuit dough. And not to forget that even the baking time is very less in time when compared to other baked treats. 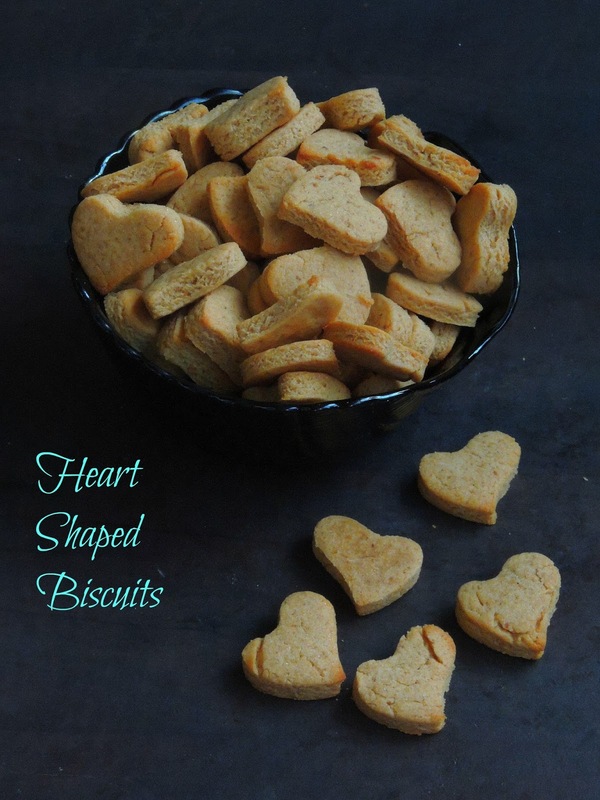 These mini sized heart shaped peanut butter biscuits are dangerously addictive to munch if your sweet tooth craves for something sweet and nutty. Snowball cookies, these cookies are best to pack to gift or to enjoy with your favourite drink. These cookies have many names depending upon the countries they comes from. 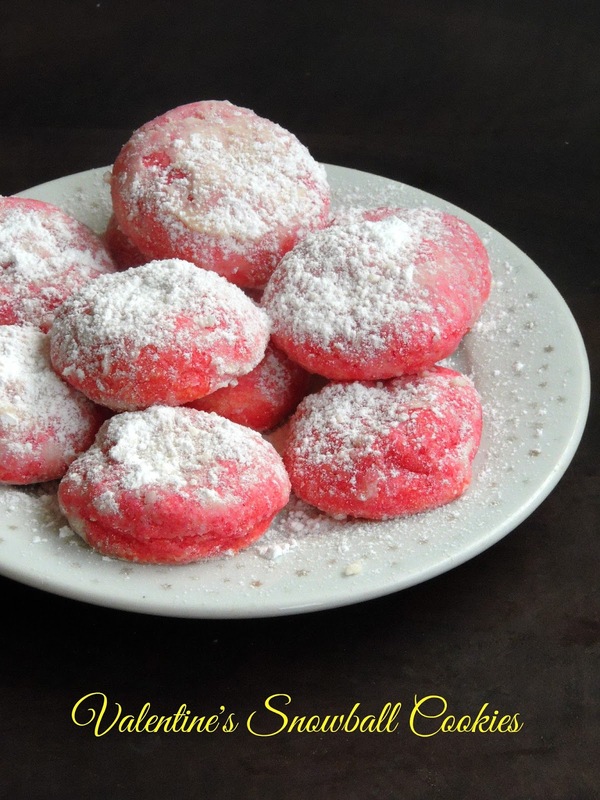 Snowballs cookies are also known as Russian tea cakes, Mexican wedding cookies, Snowdrops, Butter balls and more. These cookies suits prefectly awesome to bake and enjoy for the upcoming valentine's day. To bake as a valentine's special day cookies, i coloured it as rose snowball cookies specially for this year's valentine's day . They tastes excellent as much as like Shortbread cookies. Easy and simple to make these cuties are seriously very attractive to munch as they are absolutely delicious. 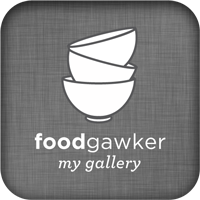 This week's posts are going to Valentine's special foods aka baked goodies. Though i dont celebrate this day, i would love to share some valentine's friendly recipes as i picked Valentine's Day Recipes as theme for this week's blogging marathon. 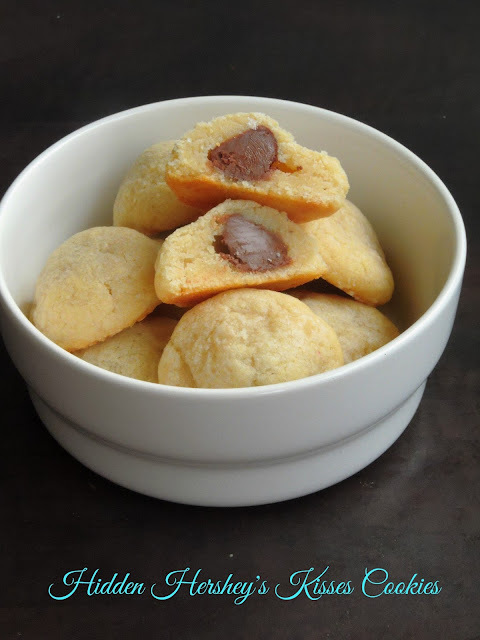 My today's post is a simple but yet a dangerously addictive, buttery, eggless almond cookies with hershey's kisses. If you are living in United States, you know very well about this hershey's kisses. Hershey's kisses have a distinctive shape which looks like a flat bottomed tear drops, this chocolate are wrapped in aluminum foil with a narrow strip of paper protruding from the top. You can bake some stunning cookies with this chocolate. Indian sweets, especially milk sweets are popular around the world. Though we live far away from India, we never miss milk sweets here at home. 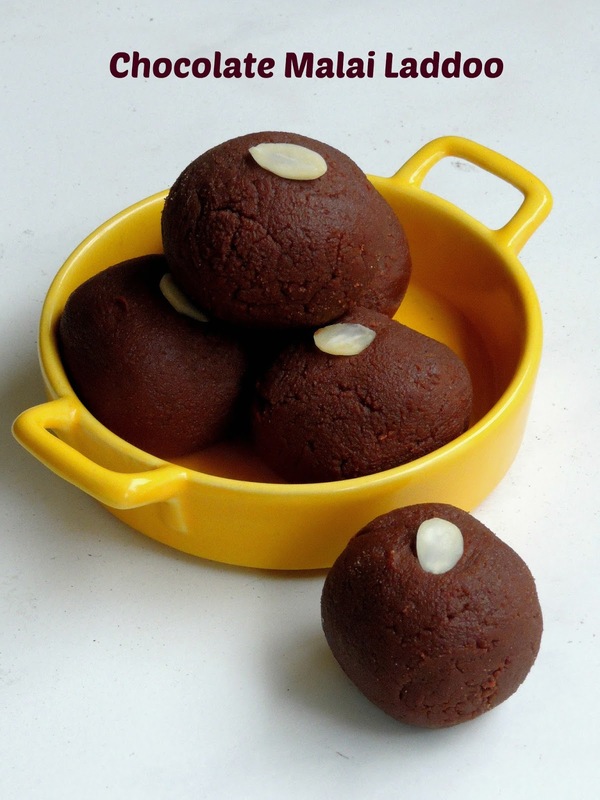 I love to replicate the traditional milk sweets at home either with paneer or else the famous Ricotta cheese. Malai laddoo aka paneer laddu is one of the popular Indian sweet you can prepare easily with condensed milk and grated paneer. This ultimate sweet balls aka laddoos are very simple to prepare and easy to roll out, you will definitely love to prepare this balls especially during festivals. If you dont have any idea or feel lazy to prepare a sweet dish for a get together or for a festival, dont forget to check this fantastic, rich malai laddoos. Parfait is a rich cold dessert made usually with whipped cream, eggs and loads of fruits, however nowadays parfaits are made in so many fantastic versions. 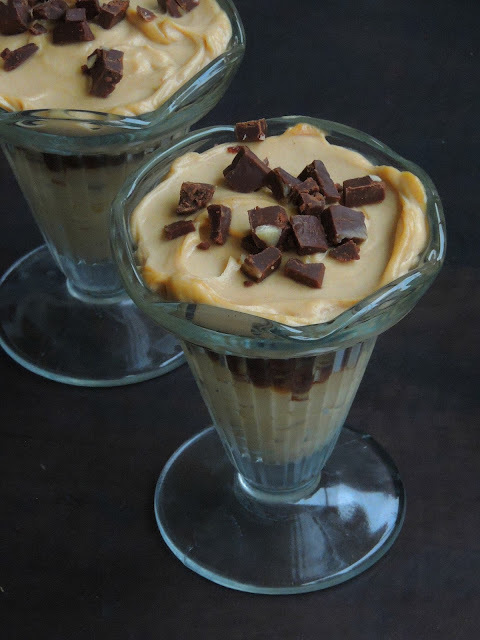 This chilled sweet treat is definitely a crowd pleaser and you can whisk many delicious parfaits with simple and easily available ingredients. My today's post is a super easy parfait which i prepared simply by whisking mascarpone cheese, sugar and milk which i topped with a simple mixed berries couli. This dessert is a must try if you are planning something easy to serve after a meal. 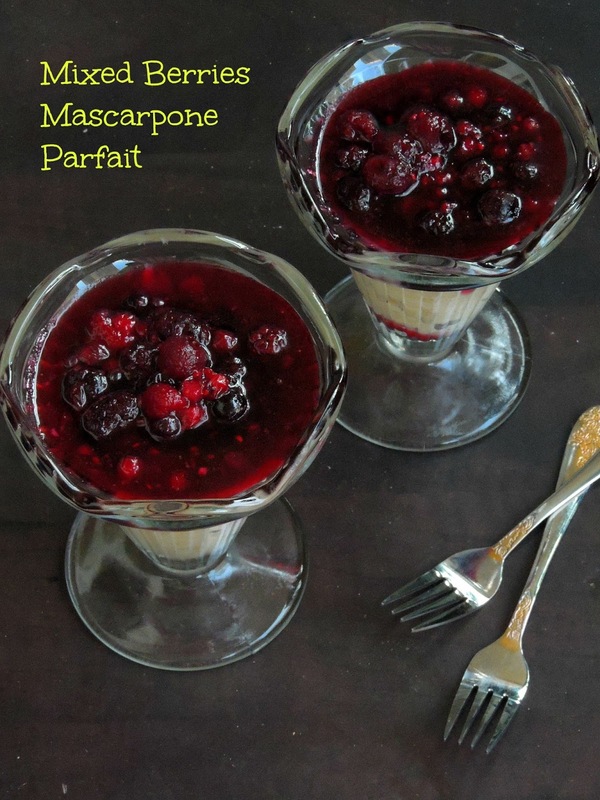 The mild sourness of the berries when mixed and relished with smooth mascarpone cheese will definitely please everyone's tastebuds. Within few minutes, you can prepare this ultimate dessert. Ricotta cheese, this cheese is definitely a must if you want to try some easy versions of traditional milk based recipes. Trust me ricotta cheese makes excellent milk sweets with less efforts than compared to traditionally prepared milk sweets which calls for few hours of stirring and cooking. Ricotta cheese makes excellent Kalakand aka Milk burfi, it tooks hardly less than 20 minutes. You can prepare this lipsmacking sweets either in microwave oven or else in stove top. And my today's recipe calls for stove top cooking. Obviously you need to stir until the cheese mass comes out of the vessel. 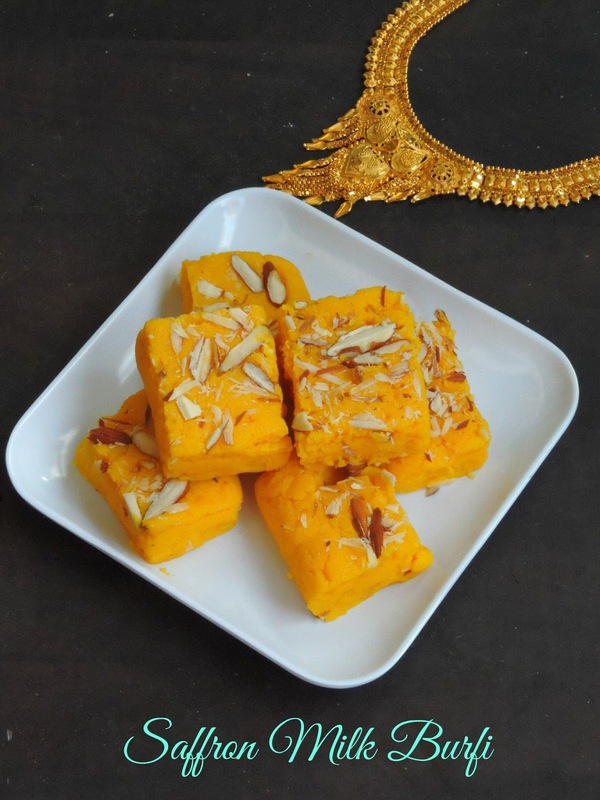 Since i want a rich looking milk burfi, i couldnt resist to add a generous pinch of Saffron and trust me this kalakand makes a rich sweet to serve after a meal.